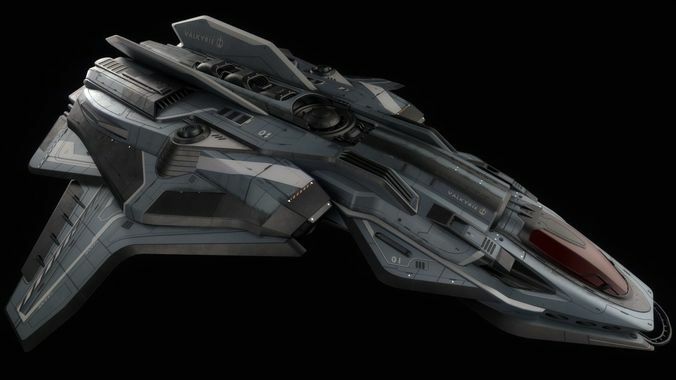 The Valkyrie is a sleek spaceship with strong ergonomic elements based off of modern aircarft. It has integrated manuevering thrusters and a rare EMP generator built into it. Hydraulic based landing gears sit flush with the hull when not deployed. The Valkyrie is a highpoly game asset using PBR. It is using an innovative decal system to define intricate detail across the ship. The decal process is inspired by the work done on Star Citizen and Alien: Isolation. Cool work! But HighPoly and GameAsset? I dont understand that ^^ ;) If you have a baked LowPoly with Metallic/Roughness Workflow Textures, drop me a line! Great design (maybe because I'm a Star Citizen fan), imo, awesome support and amazing ongoing (!!) development with adding new features as cockpits, rigging and etc. Mccarthy3d is a worthy author for investing in his art to work with, I look forward to his future work! Super nice model; very well-exectuted hardsurface work. Love it.